Bolivia Facts. Fun Facts About Bolivia. Bolivia Country Information. On this page you'll find links to the thousands of Bolivia facts we've shared on this site. Bolivia is an amazingly diverse country in every sense of the word. Landlocked and located in the heart of South America, in Bolivia culture draws strongly from deep multi-ethnic indigenous roots, centuries of Spanish colonial occupation, the influence of its five neighboring countries, and numerous very diverse foreign immigrant populations. The curious history of Bolivia has been shaped by colorful conditions as reflected in the unusual changing colors of the Bolivia flag and its nine state flags. See all Bolivia's national emblems. In rugged Bolivia government has been tumultuous and very difficult, especially since the country gained its independence from Spain in 1825. The economy in Bolivia continues to undergo transitions as the country desperately searches for a more self-sustaining system that will release it from its almost complete dependence on traditional global trade models. However, Bolivian politics often hinder success. Another factor that impedes development is the availability and extent of education in Bolivia. 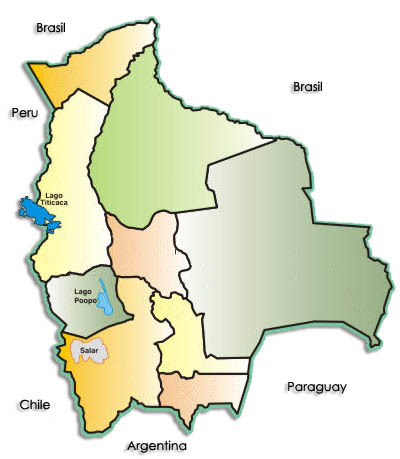 The population of Bolivia, which still remains relatively small, is concentrated in the three major cities of Bolivia: Santa Cruz, La Paz, and Cochabamba although there are several secondary Bolivia cities that are seeing rapid growth as roads and transportation improve, and more industry, goods and services reach other regions of the country. These are El Alto (once a small suburb of La Paz but autonomous since the 1985), Sucre (the only capital of Bolivia), Tarija, Oruro, and Potosi. In varied, rugged Bolivia geography has played a very important part in the economy and the distribution and diverse ethnic make-up of its population. You can find a map of Bolivia for more on Bolivia and its regions here. See these pages on the major cities of Bolivia and famous people from Bolivia. The western half of Bolivia is cold, arid and nearly impenetrable in some places. It is difficult to develop transportation and agriculture in this region; however, this is offset by its beauty and colorful Andean cultures. Most of the country's most visited tourist destinations in Bolivia are located in the Andes Mountains and highlands and most of the 10 top tourist attractions in Bolivia reflect the country’s Aymara and Quechua population, making tourism a very important source of income here. Because of this, most of the Bolivian art and Bolivian music and dances known around the world come from this region as well. Moreover, for the past 500 years most of the country’s wealth, stemming from rich silver and tin mines, has been concentrated in this area and little of it was ever invested anywhere else. The eastern half of Bolivia is covered in vast valleys and plains, rolling hills and lush rainforest. This hot, humid half is home to over 20 ethnic groups, each with very distinct customs and traditions. This half is also home to over 40% of all the Earth’s known wildlife and most of the wildlife in Bolivia and its endangered species. It has the most suitable geography of Bolivia for agriculture, animal husbandry, cattle ranching, transportation, and expansion; yet remained largely ignored and underdeveloped until the 1990’s when foreign companies invested in Bolivia’s now powerful oil and gas industry. Two of Bolivia’s nine states, Santa Cruz and Beni, produce close to 80% of all Bolivian food and agricultural products, and contribute over 40% of Bolivia’s gross national product. In this area of Bolivia people developed and industrialized the region through private enterprise. In Bolivia climate has also been a key factor for development and varies greatly by region due to the country’s extremes in topography (see our Bolivia map page.) For the most updated facts about the climate in Bolivia and the weather in specific Bolivia cities, visit our Bolivia travel forum page and click on a city name. Climate is almost as important as culture in determining the types of Bolivian clothing that are traditional to different regions. Read more about Bolivian traditions and customs here. There are also many different belief systems in Bolivia. Read about them on our Bolivia religion page or read through these Bolivian Myths and Legends. If you plan to travel Bolivia, be sure to visit our Bolivian festivals, holidays and special occasions pages as they may affect your itineraries. They also contain many interesting facts about Bolivia culture and customs. Our Travel Planner contains information on hotels and hostels, airlines, and hundreds of other facts and travel information. View our events in Bolivia and Bolivian sports pages for fun activities, things to do and ways to entertain yourself all over the country. Also see our page on traditional Bolivian games, some of which are very dangerous! Welcome to Bolivia!